MOUNT PROSPECT, ILLINOIS, (October 28, 2015) – As the crisp fall air makes its debut, a heat wave is coming to dinner tables across the country. Today, R&B Foods announced the launch of RAGÚ® Spicy Italian Style Sauce as demands rise for bolder, more adventurous flavor experiences. Spicy foods are preferred more than ever, and this bold new flavorful number is the perfect addition to heat up dinner that the whole family will enjoy. RAGÚ Spicy Italian Style Sauce appeals to palates that prefer a touch of heat. It provides a robust blend of 100 percent California-grown tomatoes, red bell peppers and ground red pepper flakes that are guaranteed to add the right amount of flavor and spicy kick to any dish. A recent study by Kalsec found that 80 percent of consumers enjoy spicy food and that 73 percent prefer dinner to include hot or spicy foods. RAGÚ Spicy Italian Style Sauce provides consumers a fun way to heat up mealtime — making it perfect for family-friendly meals like Spicy Braised Chicken and Penne or Spicy Veggie Quesadillas. RAGÚ Spicy Italian Style Sauce is available at select grocery stores nationwide at a suggested retail price of $2.09-$2.49. For delicious recipe ideas using RAGÚ Spicy Italian Style Sauce, visit www.RAGU.com. 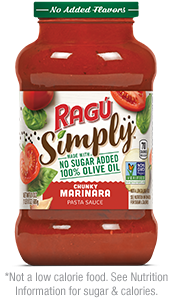 The RAGÚ® brand was founded in 1937 by Assunta Cantisano and was originally sold from her front porch in Rochester, New York. Assunta carried her family’s recipe from Italy when she immigrated to New York in 1914 and has now been enjoyed by American families for nearly 80 years. With a wide selection of sauce varieties ranging from the beloved Old-World Style to Meat Creations and Organic, RAGÚ sauce is always simmered in tradition. 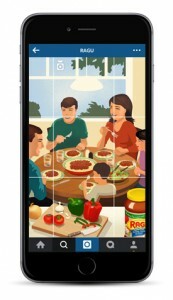 Today, RAGÚ sauce is the go-to pasta sauce for families coming together to share a quick and delicious meal. For the very latest news, recipes and more from the RAGÚ brand, please check out the brand at www.RAGU.com. You can also follow them on Facebook, Twitter and Pinterest. R&B Foods, Inc., is the largest maker of pasta sauces in the United States. Founded in 2014 with the acquisition of the RAGÚ® and Bertolli® pasta sauce brands, R&B Foods is a subsidiary of the Mizkan Group, a global, family-owned company with a 200+ year heritage of creating foods that make life delicious. The RAGÚ brand was created in 1937 and became available nationally in 1970. Bertolli sauces, part of the Bertolli brand line-up that originated in Tuscany in 1865, were launched in the United States in 2001 and fast became a popular choice for consumers in the premium pasta sauce market.